Welcome to the first Vedic Mathematics Newsletter. If you are working with Vedic Mathematics- teaching it or doing research please contact us and let us include you and some description of your work in the Newsletter. Perhaps you would like to submit an article for inclusion in a later issue. If you are learning Vedic Maths, let us know how you are getting on and what you think of this system. I recently heard of a young lad who went for a job interview. One of the questions they asked him was to find 20 per cent of some number. When he gave the answer they asked him how he did it and he said "I used Vedic Maths". Apparently he was the only one who gave the correct answer and was given the job. There will also be an article in each issue on some aspect of Vedic Mathematics. The ancient system of Vedic Mathematics was rediscovered from the Vedas between 1911 and 1918 by Sri Bharati Krsna Tirthaji (1884-1960). The word 'Veda' means 'knowledge' and also refers to a set of ancient Indian texts written in Sanskrit. These texts were written down about 1700 or 1600 BC according to western scholars but the content of the Vedas was passed on by an oral tradition long before writing was invented. The Vedas are said to cover every aspect and area of knowledge: grammar, architecture, ethics, astronomy etc. are all covered. During the nineteenth century there was a great interest in the Sanskrit texts in Europe. Bharati Krsna tells us some scholars ridiculed certain texts which were headed 'Ganita Sutras'- which means mathematics. They could find no mathematics in the translation and dismissed the texts as rubbish. Bharati Krsna, who was himself a scholar of Sanskrit, Mathematics, History and Philosophy, studied these texts and after lengthy and careful investigation was able to reconstruct the mathematics of the Vedas. According to his research all of mathematics is based on sixteen Sutras, or word-formulae. For example, 'Vertically and Crosswise` is one of these Sutras. Bharati Krsna wrote sixteen volumes expounding the Vedic system but these were unaccountably lost and when the loss was confirmed in his final years he wrote a single book: Vedic Mathematics, currently available. It was published in 1965, five years after his death. 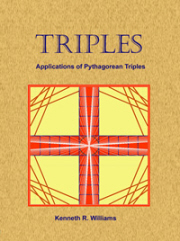 A copy of the book was brought to London a few years later and some English mathematicians (Kenneth Williams, Andrew Nicholas, Jeremy Pickles) took an interest in it. They extended the introductory material given in Bharati Krsna's book and gave many courses and talks in London. A book (now out of print), 'Introductory Lectures on Vedic Mathematics', was published in 1981. Between 1981 and 1987 Andrew Nicholas made four trips to India initially to find out what further was known about it. Following these journeys a renewed interest was taken by scholars and teachers in India. It seems that once they saw that some people in the West took Vedic Mathematics seriously they realised they had something special. St James' School, then in Queensgate, London and other schools began to teach the Vedic system, with notable success. Today Vedic Mathematics is taught widely in schools in India and a great deal of research is being done. The first Vedic Mathematics Conference was in India in 1985. Maharishi Mahesh Yogi began to explain the significance and marvelous qualities of Vedic Mathematics in 1988. He sent Dr Narinda Puri of Roorkee University on a world tour to promote Vedic Mathematics (mathematics with smiles). Maharishi schools around the world began to teach it. At the school in Skelmersdale, Lancashire, England a full course was written and trialled for 11 to 14 year old pupils, called The Cosmic Computer. This has proved very successful and is also to be published in the USA. Interest in the Vedic system is growing in education where mathematics teachers are looking for something better and finding the Vedic system is the answer. Research is being carried out in many areas including the effects of learning Vedic Maths on children; developing new, powerful applications of the Vedic Sutras in geometry, calculus, computing etc. #1. Meetings of the Vedic Mathematics society. Sat March 6, 5 pm till 7.30 pm: "9: The Ultimate Number"
Sat March 20, 5 pm till 7.30 pm: "Natural Generation: Fibonacci and other sequences"
#2. Message to M Rajendran, Vedic Mathematics researcher in India (attached to Vidya Bharati): please contact us again, your work sounds very interesting but we have not been able to send a reply to your e-mail.